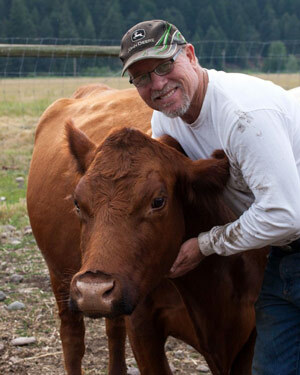 Jeff Miller, owner and rancher at Diamond Mountain Ranch with one of his beautiful cows. That’s Jeff from Diamond Mountain Ranch, a family-run ranch in the hills of northern California. It’s truly a paradise here, the bright blue sky, clear crisp air, and of course the ever important green green grass. 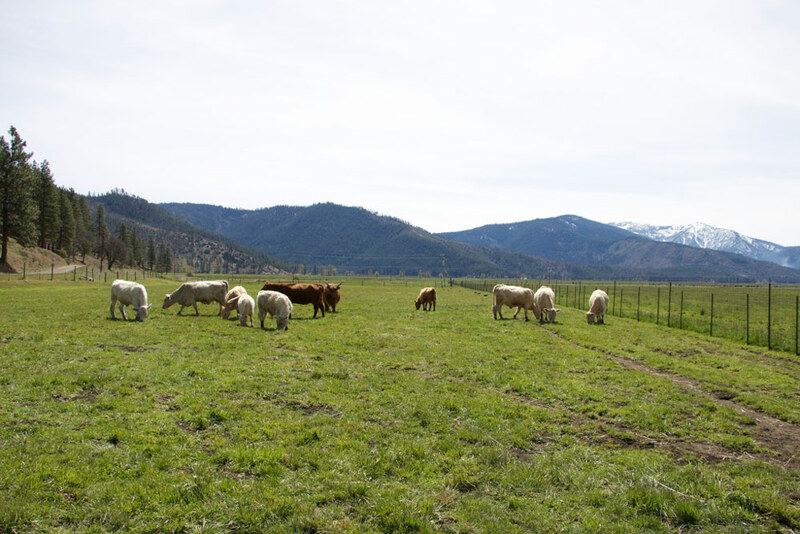 Jeff’s herd live and graze on gorgeous certified organic grass across a paradise of wide open pastures. This paradise is without a doubt the most ethical and sustainable ranch you’re likely to find in California, or perhaps anywhere else. Unlike so many “grass-fed” pretenders in the marketplace today, cows are the real deal. 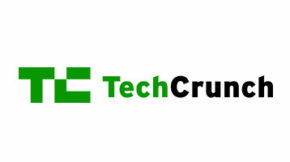 The sad truth is that many other companies who claim this title are really only “grass-finished”, a term Jeff uses to describe their shortcut. See, it’s more expensive to maintain gorgeous fields of certified organic grass. It’s constant work. It’s much more convenient and space-efficient to keep cows all crowded together munching on “feed”. Jeff chooses to do the right thing, and that’s why we choose to support him. But not all companies have such integrity. They take the easy way out, only feeding grass the minimum time requirement (the final three months of life) to receive the title grass-fed. 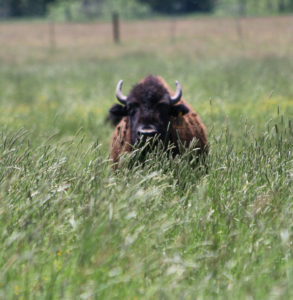 One of Jeff’s beloved bison playing peek-a-boo in the long grass. Jeff separates himself from these other companies by referring to his animals as grass-raised, a distinction that makes a world of difference. Jeff’s are grazing on a grass-only diet from birth, never fed grains or given growth hormones; making them the most humane and healthy meat around. The ranch currently includes chicken, turkey, pork, beef, rabbits, lamb, yak, goat and their specialty: bison. 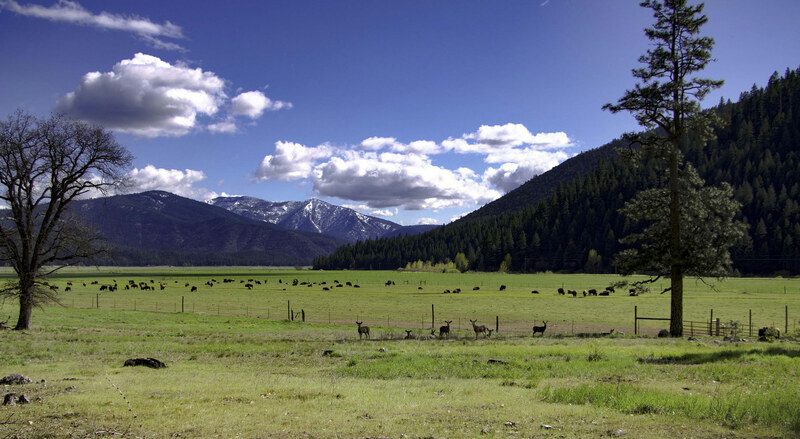 They are one of the only bison ranches in all California. All their animals are raised without additives, growth hormones, or any unnecessary treatments. 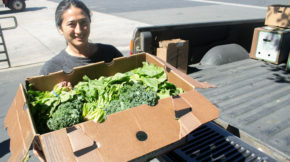 GrubMarket is all about all-natural, local, sustainable and organic. 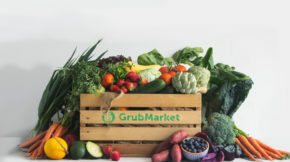 We know our choices can impact the world around us, in positive, sustainable, and eco-friendly ways; which is why we are so privileged and proud to be providing our GrubMarket family with meat from Diamond Mountain Ranch. We wanted to make sure you had the opportunity to meet your meat too, and know that it was coming from the best place on earth! You can now buy their products at here, as well as find them in your weekly Complete FarmBoxes and Meat Clubs!